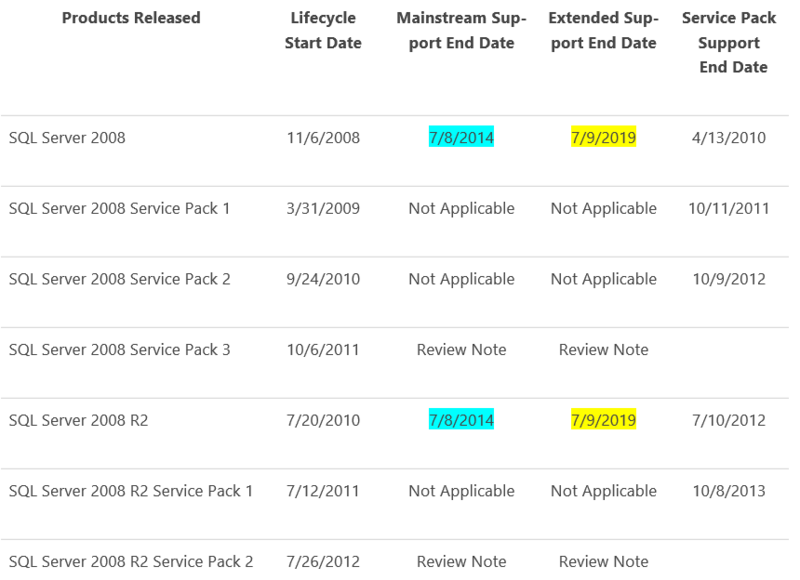 A remdnder that Mainstream Support for SQL Server 2008 and SQL Server 2008 R2 ended on July 8, 2014. – Support Lifecycle policy, found in http://support.microsoft.com/lifecycle. Customers are encouraged to prepare and execute on their upgrade and/or sustained engineering plans as early as possible for these SQL versions. Remaining current on your SQL Server version ensures that your product remains supported per the Support Lifecycle policy. Additionally, your software benefits from the many enhancements, fixes, and security updates provided through the latest releases. For both SQL Server 2008 and SQL Server 2008 R2, Microsoft will continue to provide technical support which also includes security updates during the duration of extended support. See the table below for extended support end date. Non-security hotfixes for these versions will be offered only to customers who have an Extended Hotfix Support agreement.